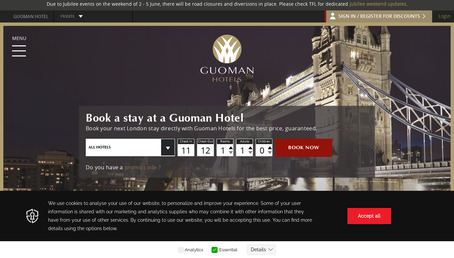 Guoman Hotels offer a range of four and five star luxury hotels in London. Book direct to save 10%. Find out more here. 10% off best available flexible rates. Includes room upgrade, breakfast, £50 food voucher plus a late check out of 2:00 pm. With so much to discover, a longer stay means you can experience it all at your own pace. And, when you stay for seven nights or more, we'll upgrade you to the next available room category, including breakfast each morning, plus other great benefits. Enjoy up to 25% off our best available flexible rates when you book for an extended weekend. Stay 3 nights and have more time to experience captivating sights of some of London's greatest attractions, take in the surrounding historical sites, architecture, breathtaking views and eateries. All with a host of extras including free breakfast and late checkout. It's a guaranteed relaxing and well-deserved break before you head into the week. 10% off best available flexible rate. Includes room upgrade, breakfast, £50 food voucher, plus a late check out of 2:00 pm. And, when you stay for seven nights or more, we'll upgrade you to the next available room category, including breakfast each morning, plus other great benefits. Enjoy 25% off our best available flexible rates when you book for an extended weekend. Stay 3 nights and have more time to experience the captivating sights of some of London's greatest attractions, take in the surrounding historical sites, architecture, breathtaking views and eateries. All with a host of extras including free breakfast and late checkout. It's a guaranteed relaxing and well-deserved break before you head into the week. Enjoy 30% off our best available flexible rates when you book for an extended weekend. Stay 3 nights and have more time to experience the captivating sights of some of London's greatest attractions, take in the surrounding historical sites, architecture, breathtaking views and eateries. All with a host of extras including free breakfast and late checkout. It's a guaranteed relaxing and well-deserved break before you head into the week.